Think of this whitening treatment as the opposite of tanning beds. It’s no secret that Koreans are fixated with brightening their complexions—you only need to watch one of their popular dramas or stalk an idol on social media to see this! And while an at-home skincare regimen can, with dedicated use, target uneven skin tone and dark spots, there’s also been an advent of salon services that help people achieve the same result. Beauty Lab Whitening by Suaviss Lab White is a non-invasive program that has whitening and anti-aging benefits. It consists of four stages: dead skin cell removal, whitening treatment, light therapy, and home care treatment. 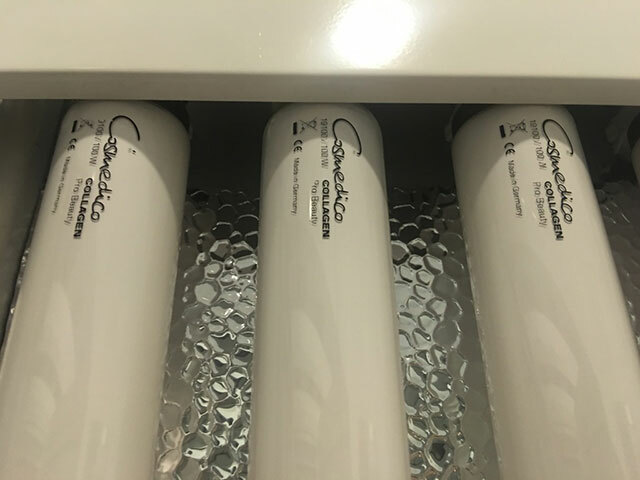 It makes use of mildly formulated products consisting of 95 percent natural ingredients, though the obvious star of the show—and what most of us won’t normally have access to at home—is Suaviss’ R-630 Collagen Light Facility. 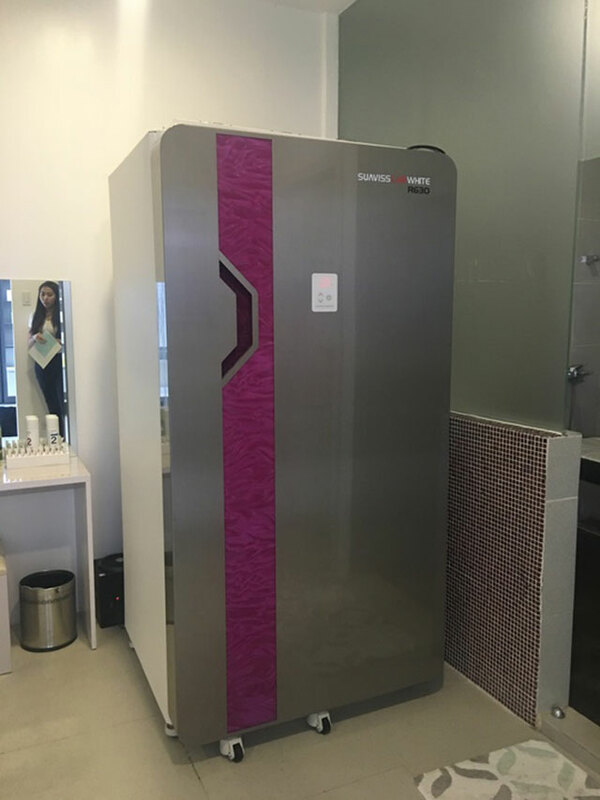 The R-630 Collagen Light Facility (or what we at Cosmo.ph have dubbed the "collagen coffin") is a cutting-edge piece of technology created in Germany. Each box contains 630nm wavelength lamps that project red light. According to The Dermatology Review, red light therapy is utilized for “the treatment of acne, rosacea, and of its ability to get rid of wrinkles.” When absorbed by the body, concentrated red light produces more collagen, which, as we all know, is responsible for making skin firm, plump, and young-looking. Furthermore, red light is considered safe for regular use. “Red LED light does not contain any type of UV light,” Dr. Martie Gidon, a Toronto-based dermatologist, explained to Best Health magazine. 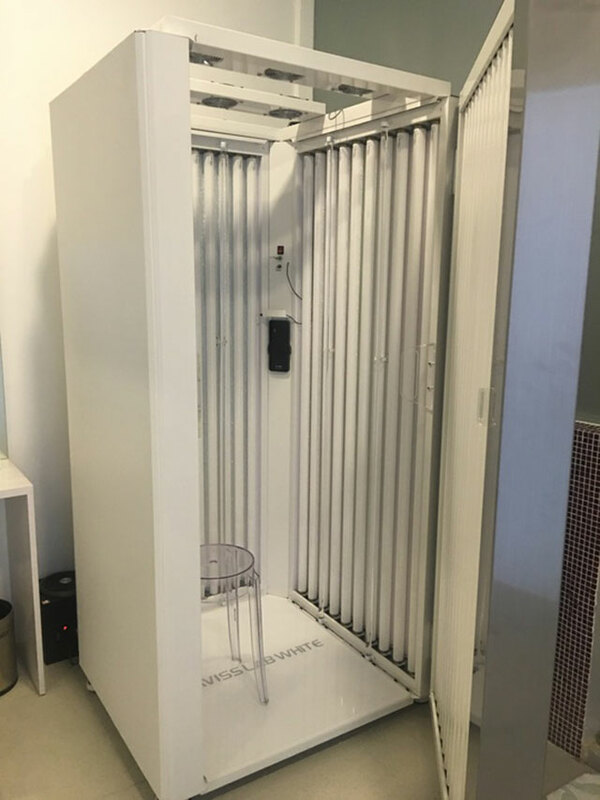 As such, you don’t have to wait too long between light therapy sessions—Suaviss recommends booking your next treatment just 72 hours after the last one. Anyone who’s ever visited a skincare clinic (or a spa, for that matter) will immediately feel at ease at Suaviss. It’s clean, which is crucial when you’re expected to strip down for the various steps in the treatment. All three rooms are private and have their own changing rooms, treatment beds and showers, and R-630 light facilities, so you won’t feel dyahe about walking around nearly naked. The clinic also provides bathrobes and disposable underwear and slippers. Upon changing out of my clothes, my therapist led me to a vanity table equipped with all sorts of skincare products and beauty tools. She then directed me to remove my makeup using the cleansing oils and creams available, and to tie my hair to prepare for the cleansing and exfoliating steps. I was then brought to a smaller room just off the main space, which had the treatment bed and shower. The therapist instructed me to lie face down, then proceeded to cleanse, scrub, and massage my entire face and body. By that, I mean every inch—from the back of my knees to my bikini area, and from my armpits to my chest. I appreciated how thorough it was, actually, since I felt like I was getting the most out of the service. But if you’re apprehensive about strangers touching sensitive parts of your body, just let the therapist know and she’ll steer clear of them, though sayang naman, especially if you want to get rid of dark inner thighs and underarms! It was also interesting to learn that Suaviss uses scrubs that are completely grain-free, a departure from the granulated ones I’m familiar with. Instead, their face and body packs contain volcanic ash that gently exfoliate and remove dead skin cells. After the exfoliating step, the therapist applied preconditioning ointments to my face and body. Those formulated by Suaviss contain moisturizing standbys like shea butter, almond oil, and hyaluronic acid, as well as a-Bisabolol, a natural whitening agent extracted from Brazilian Candeia trees. Now, for the fun part—15 minutes inside the collagen box! First-timers can dial down the time to 10 minutes, but 15 is the recommended for maximum absorption. I was asked to put on a pair of safety googles, because the light can get very bright. As in wala kang makikita sa liwanag! It can seem intimidating, but my therapist assured me it’s very safe and that she’ll be inside the room the whole time. The box itself is big enough to hold a chair and some space to move around in, so claustrophobic moments are minimized. I also loved that each box comes with a sound system, so you can hook up your phone and play some music! Trust me when I say that you’ll barely notice the heat and small space with the right playlist. Once inside, the therapist will turn on the bulbs and you’ll be assaulted with light from all sides. Don’t panic! Just let the box do its magic and soak up all that beauty light. Post-light therapy, I immediately downed a glass of water to hydrate myself. Aside from feeling a bit thirsty and having to adjust my eyes to the change of lighting, I didn’t experience any negative side effects. No dizziness or lightheadedness here! Upon looking at the mirror, I also noticed my skin was flushed and glowing—similar to the effects you get after being inside a sauna. The session ended with another round of ointment application to calm the skin down and boost the box’s lightening effects. The entire process, from exfoliating to light therapy, takes one hour and a half, which is reasonable enough for people who easily get antsy or inip. A single whole body whitening session costs P5,000. Discounted packages are also available: five sessions for P19,500; eight sessions for P27,000; and 10 sessions plus a free skincare product for P33,500. A brief background: I’ve had fair skin my entire life and never go a day without using sunscreen. I’m very meticulous when it comes to skincare and actively follow the Korean multi-step routine. So coming in, my concerns were less about lightening my skin tone, and more about targeting post-inflammatory hyperpigmentation (PIH). Though I’m constantly working on lightening them at home using spot correctors and brightening serums (so they’re at a better state now than before), I also wouldn’t mind speeding up the process. This was ideally where Suaviss would come in—I had hoped red light therapy would address those ugly dark spots left behind by breakouts and cystic acne, all of which are concentrated on my chin. 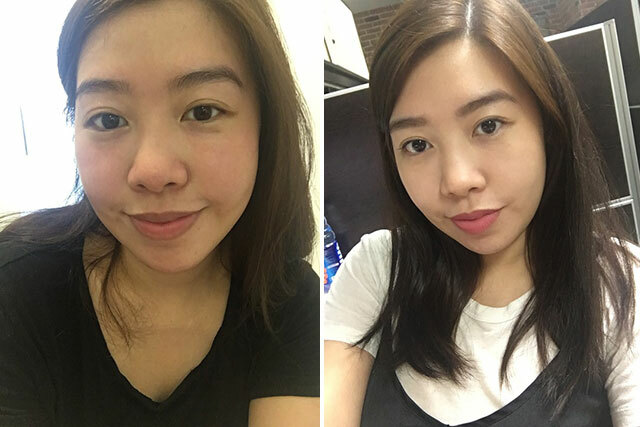 So did I see any brightening changes to my skin? Yes, to some extent. Suaviss was kind enough to sponsor Cosmo.ph three sessions, which I spaced out in the duration of a week. Three sessions after, I can’t really pinpoint if my overall tone got whiter; but again, this wasn’t my initial concern, so maybe I just didn’t pay attention to it that much. But I can say that the PIH on my chin is now barely noticeable. Before, my eyes would go straight to them when I look in the mirror; now, I don’t even notice them at all. It’s safe to say that my chin is more or less back to its original state pre-adult acne, which definitely makes me happy. My complexion also seems brighter and more glowing, and I think that’s from the combined effects of the whitening sessions, my rigorous skincare routine, and my reliance on sunscreen. However, as with most clinic services and treatments, it’s important to one, manage your expectations, and two, follow through with maintenance. I didn’t expect to come out with skin to rival Sandara Park’s after just one session—that’s unrealistic. If I wanted that kind of thing, I’d have to be prepared to invest more money in more treatments. I’d also have to make sure that I take care of my skin the rest of the time—a non-invasive treatment such as Suaviss won’t be able to replace the lasting effects of a proper skincare routine. Visit Suaviss Lab White at 3F Bonifacio Stopover, 31st St. corner 2nd Ave., Bonifacio Global City, Taguig. You may also inquire at 546-4601 or 0927-512-000, and at admin@labwhite.com.